1. Angle Interface (A30) - The angle interface offers the most adaptability for customers. Either of the 3" perpendicular surfaces of the angle may be bolted or clamped to. The standard length is 30 inches with no bolt holes. The standard finish is clear zinc plate. 2. Mounting Plate Interface (P8) (Not available on SR or DR option. See P12/A30 options.) 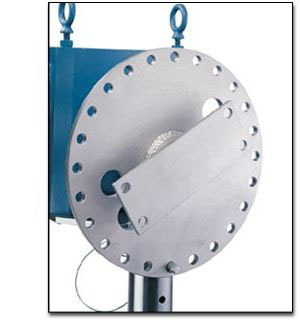 - The Part-to-be-handled can be easily bolted to this flange type interface. The standard size is 3" by 8" with a four-hole bolt pattern spaced at 7" by 2" centered on the plate. The four holes will accept up to ½" diameter bolts. The standard finish is clear zinc plate. (Available only with SR or DR option) 1. Angle Interface (A30) - The Angle Interface offers the most adaptability for customers. Either of the perpendicular surfaces of the angle may be bolted or clamped to. The standard length is 30 inches with no bolt holes. The standard finish is clear zinc plate. The A30 Angle is bolted to the P12 Mounting Plate and may be removed if the customer desires to mount directly to the P12. 2.Mounting Plate Interface (P12) - The Part-to-be-handled can be easily bolted to this flange type in interface. The standard size is 8" x 12" with an eight-hole bolt pattern spaced at 10.5" x 6" centered on the plate. The eight holes will accept up to 1/2" diameter bolts. The standard finish is clear zinc plate. 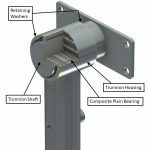 Indexed @ 15° increments to prevent trunnion rotation with a lock pin. The Index plate can be supplied with either the P8 Mounting Plate Interface(shown below) or the A30 Angle Interface, or the P12/A30 Combination Mounting Plate / Angle Clamp. 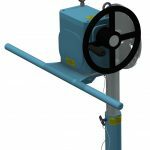 1.4 bolt-on Leveling Jacks allow for leveling of load while in a stationary position. 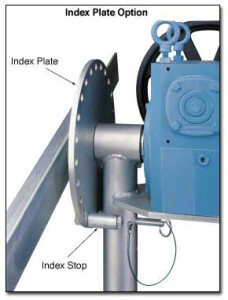 Orientation of jack handles relative to the frame must be specified. 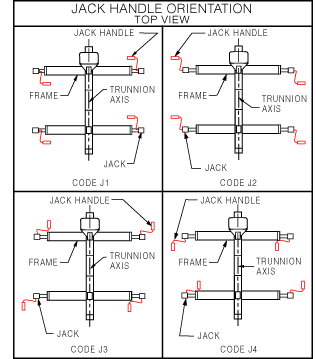 See the JACK HANDLE ORIENTATION TABLE below to determine which handle orientation suits your application. Codes J1 through J4 are shown. Code J0, which is not shown, is for jack mounting plates only but does not include jacks. The J0 option allows for future addition of jacks. The Jacks have 1" of rise for each 8 turns of the crank handle. 1. 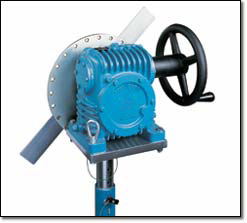 Optional 60:1 ratio Single reduction Gearbox (SR): This gearbox offers heavier duty construction than the standard gearbox, plus low backlash and slightly more resistance to stair stepping. 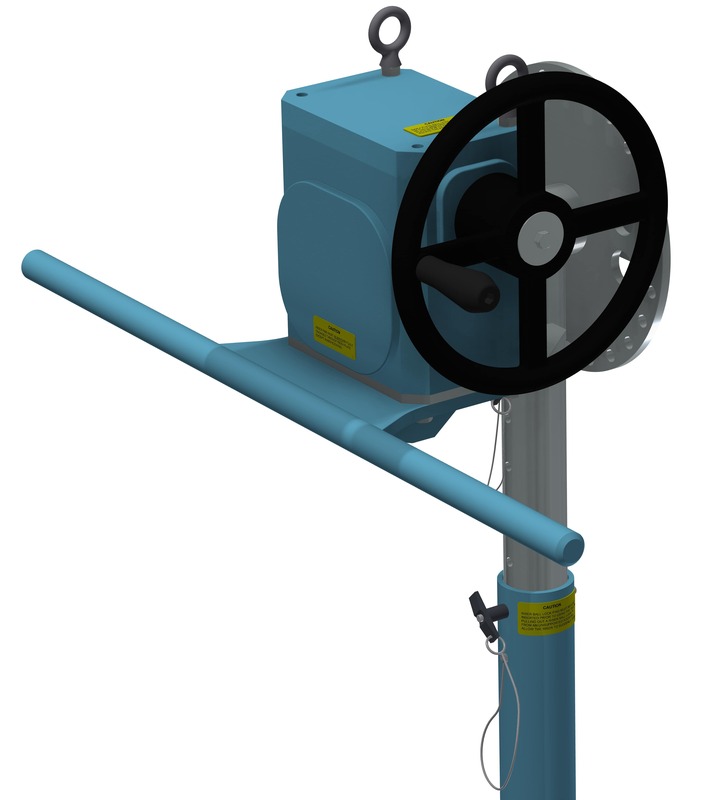 NOTE: Addition of the optional SR or DR gearbox decreases the vertical riser adjustment by 2". 2. Optional 250:1 ratio Double Reduction Gearbox (DR): This gearbox offers heavier duty construction than the standard gearbox, plus low backlash, 3000 in-lbs easy crank torque (versus the standard 2000 in-lbs easy crank torque), and is immune to stair stepping at nearly all reasonable inertia's and torques. 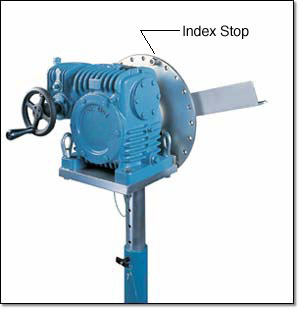 NOTE: Addition of the optional SR or DR gearbox decreases the vertical riser adjustment by 2". For use in electrostatically protected areas (EPA's). Proper electrostatic discharge (ESD) grounding of the fixture must be a part of the overall EPA design. (See Technical section discussion on ESD. Forklift tubes are bolted to the bottom of the end frames and span the length of the fixture. 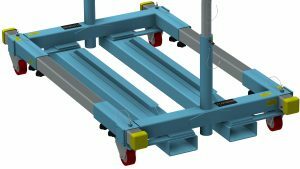 They are designed with a stiffener I-beam welded to the top of the forklift tubes so that the forks do not need to span the entire length of the fixture if long enough forks are not available. It is critical that the forks extend at least two feet past the combined fixture and payload CG. If you are unsure of how long the forks need to be for your application, please contact Flotron. The forklift tubes are compatible with all of the 700 series except for the XD739 models. The forklift tube option can be retrofitted on existing Flotron Rotation Fixtures. 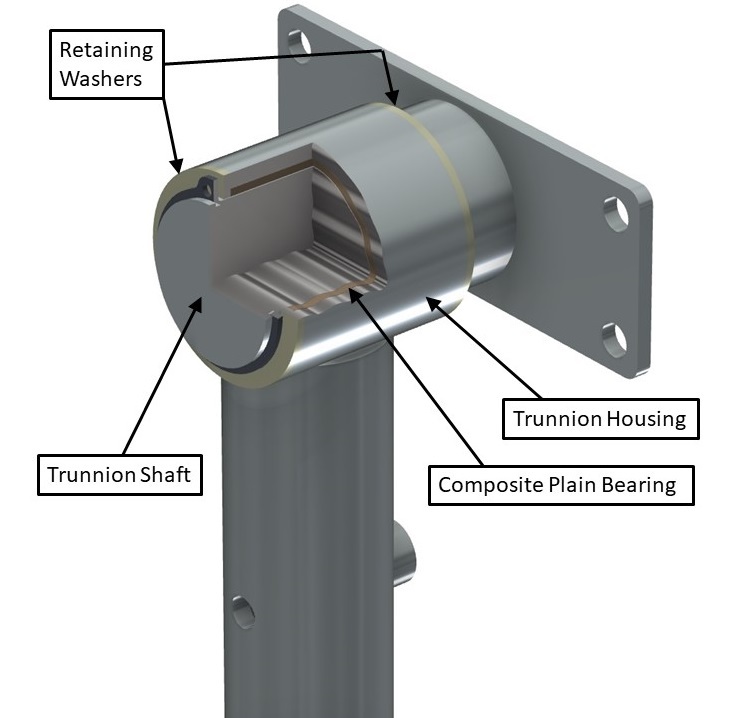 PTFE composite plain bearing is placed between the trunnion shafts and bearing housings on both vertical risers. The bearings are self-lubricating and therefore do not require any maintenance, prevent wear of the trunnions, and lower rotational friction. This option is recommended when rotational duty cycles are high (frequent rotation), when there is a long interface distance (over 100”), or when the payload is relatively flexible and sags in the middle. A removable towing insert is mounted to the main beam via two ball lock pins. Attached to the towing insert is either a lunette ring (T1) or ball coupler (T2) depending on which option is chosen. 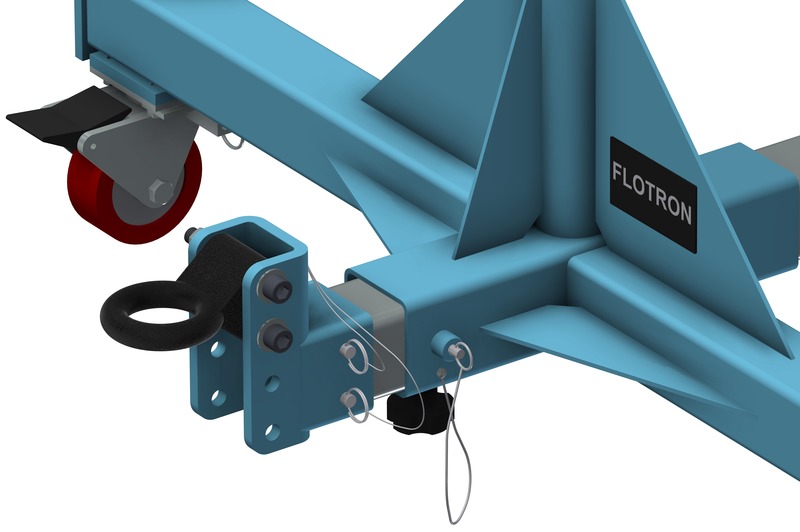 The tow ring/coupler’s height can be adjusted in 2-inch increments from 8.25” – 12.25” (as measured from floor to interface centerline) by changing its position on the C-channel and lowered all the way down to 5.25” if the tow insert is flipped upside down. The towing interface option is not compatible with double beam fixtures. If a towing feature is needed for a double beam fixture, it is recommended to add a towbar (modified standard). 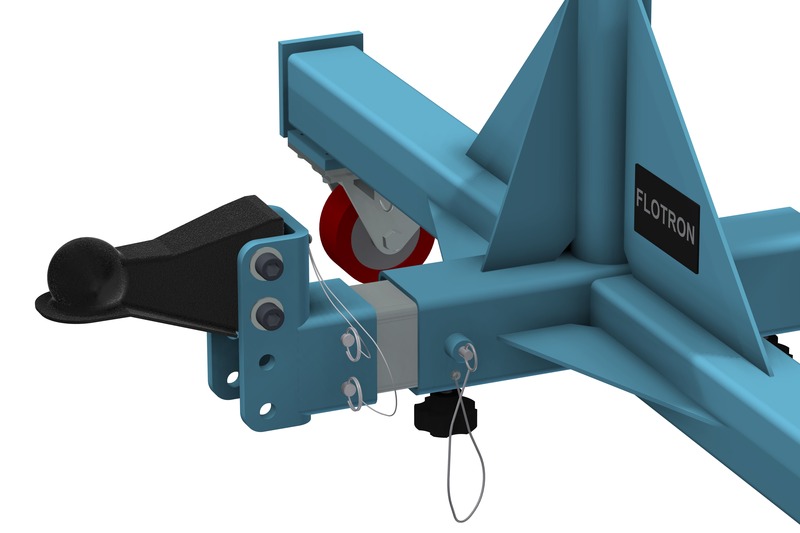 The towing interface option can be retrofitted on existing Flotron Rotation Fixtures.